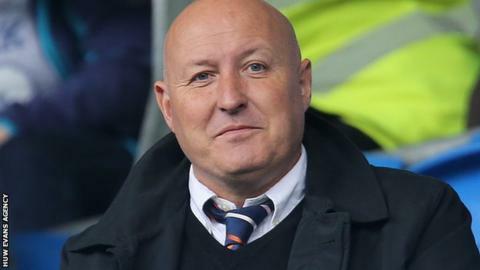 Russell Slade says he is trying to slash Cardiff's wage bill while trying to mount a Championship play-off bid. "We are having to shop in a different area. We are not shopping at Harrods now," said Slade. But Slade has denied cutting costs means a watering down of commitment from Malaysian owner Vincent Tan, or giving up hopes of a top-six finish. "The ambition is still to attempt to try and get into the top six, despite the translation and despite reducing the wage bill," said Slade. "But if we cannot do that, at least we have a long-term strategy going forward in terms of a budget which is sustainable. "We are bringing in personnel that we feel will move the club forward in the long term." Cardiff have accepted a bid, believed to be upwards of £1.5m, from Sheffield United for defender John Brayford and Slade says there have been some inquiries from other clubs to take striker Adam Le Fondre on loan. If Brayford leaves he will be the fifth permanent departure under Slade, following the exits of Juan Cala, Magnus Wolff Eikrem, Matts Moeller Daehli and Jo Inge Berget - and more are set to go this month. But Slade is hopeful of adding Huddersfield defender Lee Peltier, having recruited Alex Revell from Rotherham and Millwall's Scott Malone already this month.